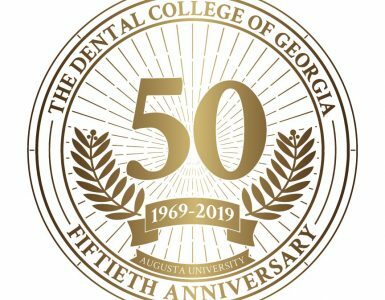 The Dental College of Georgia celebrated the fifth anniversary of its building Sept. 30. The facility has housed treatment for nearly 25,000 patients a year since its doors opened in September 2011. “This is a valuable patient care resource to our community,” said Dean Carol A. Lefebvre, adding that as the DCG students’ and residents’ training ground, its benefits extend far beyond Augusta. “As the only dental college in Georgia, we prepare our students to provide skilled and compassionate oral health care in communities throughout Georgia and beyond. It’s hard to believe it’s been five years since we moved into our beautiful facility.” The anniversary coincided with the replacement of former signage by the new AU logo and DCG name. Ahmad Bhatti, who earned his degree from The Dental College of Georgia this spring, was honored at the 2017 Pierre Fouchard Academy meeting as the recipient of the academy’s 2016 national scholarship. The meeting was held in Greensboro in February. Two DCG faculty members were also honored: Dr. DJ Pannu received the 2016 PFA Excellence in Dental Education Award, and Dr. Douglas Cleveland received the 2017 PFA Volunteer Clinical Faculty Award. Also at the meeting, two DCG students presented their research. Kevin Shepherd, a third-year student, shared his findings regarding the effects of toothpaste and toothbrush types on denture base abrasion, and Scott Lowry, a second-year student, presented the microbiological effects of periodontal treatment on patients with hyperglycemia. The PFA was founded in 1936 to cultivate leaders in the dental profession. Researchers at Augusta University recently obtained a patent for a predictive, diagnostic and prognostic kit that will help address issues surrounding Sjogren’s. Sjogren’s syndrome is an autoimmune disease in which the body’s immune system, for unknown reasons, attacks the cells which produce saliva and tears. The results are dry eyes, dry mouth and even tooth decay, and if left untreated, Sjogren’s syndrome can progress to arthritis and, in rare cases, lymphoma. Patients also experience fatigue, nausea and pain. The disease affects approximately 1 percent of the population, according to Dr. Babak Baban, associate professor in the DCG and the Medical College of Georgia. It also affects more women than men, and kept Williams away from her sport for almost two years. Baban is an immunologist interested in finding cures for autoimmune disease. He partnered with Dr. Mahmood Mozaffari, professor of oral biology at DCG, and Dr. Rafik Abdelsayed, professor of oral biology and pathology at DCG, to study Sjogren’s syndrome. The team presented their data to Augusta University’s Office of Innovation Commercialization. At the time, the research was in the preliminary stages, but it showed that Sjogren’s could be detected in the blood in the early stages. The team developed a method that would diagnose the disease with a simple finger prick. The protocol can also determine susceptibility to the disease, if a person has it and how treatment will affect each individual. The next step was to submit a patent application to the U.S. Patent and Trademark Office. Almost three years later, the USPTO approved the application, and a patent was issued. Now, the team will focus on further advancement to develop a kit with the ultimate goal of parterning with a pharmaceutical company to produce the kit. Baban, Mozaffari and Abdelsayed are excited that their work is receiving recognition. “It’s a great feeling to see that your efforts have been recognized not only by the university but by the federal authority,” Baban said. “This patent means they see the importance of the discovery and are recognizing it. Dr. Allison Buchanan Hunter, associate professor in the Department of Oral Health and Diagnostic Sciences, has received the 2017 Omicron Kappa Upsilon Charles Craig Teaching Award. She is the first DCG faculty member to receive the national award. The award honors young dental educators who use new and innovative techniques in teaching the art, science and literature of dentistry. Eligible candidates must be full-time educators in a dental school accredited by the American Dental Association’s Commission on Dental Accreditation. Buchanan, a board-certified oral and maxillofacial radiologist, is a DCG alumna and completed residency training at the University of Texas Health Science Center at San Antonio, where she also earned a master’s degree. She teaches both at the pre- and post-doctoral levels and researches cone beam computed tomography and digital radiography. The Department of Oral Rehabilitation has been renamed the Department of Restorative Sciences to better reflect the scope and breadth of its services, according to Dr. Kevin Plummer, chairman. “We researched other institutions and asked for insight from faculty, students, alumni and administrative staff in translating the department’s broad mission into a name,” he said. The Department of Oral Rehabilitation was established in 1992 when two departments were joined to address curricular and other changes during a period of rapid growth for the dental college. 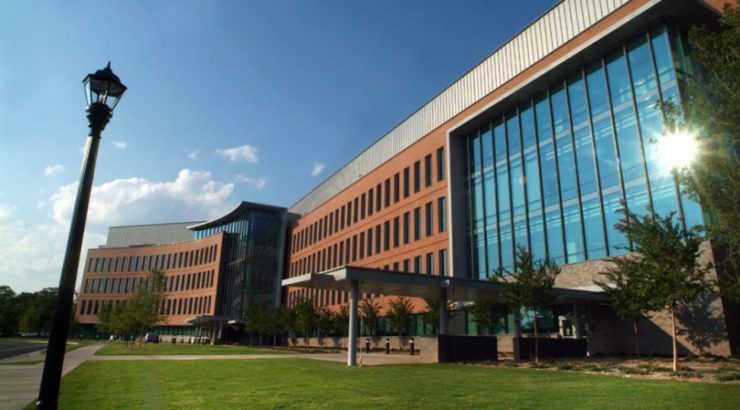 The new name, Plummer said, better denotes its role as the college’s largest department (37 full- and part-time faculty), responsible for over 50 percent of the pre-doctoral dental curriculum. Dr. Mohamed Sharawy, professor in the Department of Oral Biology, has had a charitable gift named in his honor at the University of Texas Health Science Center School of Dentistry. The donation will help fund patient care, treatment programs, research, professional education and scholarship. Sharawy, who earned his dental degree at Cairo University in Egypt, earned a PhD in anatomical sciences from the University of Rochester as a Fulbright Scholar. He is a founding DCG faculty member and has mentored dozens of national and international PhD students. He has extensively researched bone and implants and is co-editor and contributor to Orban’s Oral Histology. He has authored over 100 original research papers and over 200 abstracts. He is president of the state of Georgia’s Anatomical Board and is a member of the board of directors of the American Academy of Implant Dentistry Research Foundation. The crowd was all smiles on Jan. 28 for the Augusta University Student National Dental Association’s (SNDA) inaugural basketball tournament to benefit A.R. Johnson Magnet School’s Essentials of Dental Science Program. Students, faculty and staff from A.R. Johnson and The Dental College of Georgia community participated in the tournament, raising more than $1,500. The money raised will allow SNDA to purchase new equipment, furniture and supplies for A.R. Johnson’s dental lab. The lab gives high school students the opportunity to be exposed to the dental field in hopes of gaining more applications for dental assisting, dental hygiene and dental school programs. The SNDA is a national organization dedicated to promoting and increasing minority enrollment and retention in dental schools across the U.S. The SNDA is also committed to improving delivery of dental health to all people with an emphasis on minority communities and the medically underserved. Special thanks to tournament winners and second-year DCG students Jackson Griffeth, Carlisle Vason and Kevin Shepherd. A DCG student was elected Speaker of the House of Delegates for the American Student Dental Association (ASDA) during the national organization’s annual meeting in Orlando, Florida, in March. Abby Halpern, currently finishing her last year of dental school, brings a substantial amount of background knowledge and experience with ASDA to her new position as House Speaker. Prior to the election, she spent two years on ASDA’s Council of Advocacy and served as president of ASDA’s Georgia chapter. The ASDA House of Delegates also elected a new president and two vice presidents during the national conference. Each group member chosen for a leadership role will serve their peers and endeavor to uphold organizational values for the next year. On Feb. 8, 22 DCG students volunteered for Lessons in a Lunch Box, an oral health literacy initiative developed by the Children’s Oral Health Institute and created to combat dental neglect and oral abuse among children. Taking advantage of National Children’s Dental Health Month, the volunteers delivered special lunch boxes to 154 first- and second-grade students at Lamar-Milledge Elementary School. The lunch boxes contained floss, a toothbrush and toothpaste. Organized with the help of Dr. Carole Hanes, the event was well-received by the students, and school officials have reported an uptick in their student’s oral care after the presentation. 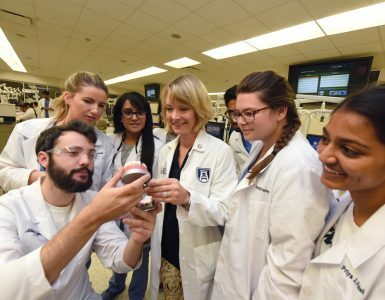 The Dental College of Georgia has partnered with the Benemérita Universidad Autónoma de Puebla, a public institution with a dental college based in Puebla, Mexico, to share visits, programs and consultations advancing the dental profession. The relationship began in April 2016 when university representatives attended a continuing education course taught by Dr. Mario Romero, DCG assistant professor of restorative sciences, and invited him afterward to collaborate with their prosthodontics program. They have since exchanged visits and lectures, and Romero hopes to conduct his continuing-education course at the university annually or semi-annually. National Tooth Fairy Day is Feb. 28, and whether your kids believe in the legend or not, the tooth fairy is one of the dentist’s helpers to teach children about proper oral hygiene. The tooth fairy legend is believed to have originated in the United States during the early part of the 1900s as a way for parents to celebrate the loss of a child’s baby teeth. Children traditionally place the tooth under the pillow at night and awaken the next morning to find money left by the tooth fairy. Although it is hard to understand why the fairy would want teeth, rumor has it that these fairies are constructing their queen a castle from the cleanest and best cared-for teeth, which might explain why these tiny tooth collectors always leave the child a token of their appreciation. 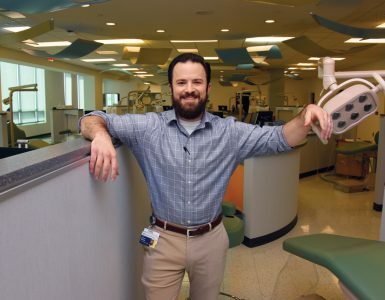 In an effort to extract more details about the alluring myth of the tooth fairy, pediatric dental resident Ken Sellers shared a story of how his mother and the tooth fairy helped one of his patients stay calm during her visit to The Dental College of Georgia. With a bit of quick thinking and a little help from Sellers’ mom, the tooth fairy helped calm the child’s fears and discomfort. Whether or not parents talk to their kids about the tooth fairy, Sellers says there are so many fun ways to get kids excited about daily dental hygiene. The mouth is widely considered the most contaminated part of the human body, yet babies have surprisingly low infection rates following cleft lip and palate surgery. Now, researchers have the first evidence that one reason may be the presence of what they call the SWAT team of immune cells. They examined lip tissue removed during cleft lip repair of 13 babies at Children’s Hospital of Georgia. They found innate lymphoid cells, or ILCs, a type of immune cell that functions like a natural antibiotic to recognize and attack invaders like bacteria. In the average mouth, where hundreds of types of bacterium have been documented, there is plenty to target. “ILCs are newly discovered as one of our immune cells, but they are really old. We had just missed them,” said Dr. Babak Baban, immunologist in the Department of Oral Biology at The Dental College of Georgia and in the Department of Surgery at the Medical College of Georgia at Augusta University. “Their presence helps explain why we don’t have more surgical site infections than we do,” said Dr. Jack Yu, professor of pediatric plastic surgery at MCG. Scientists began to report about ILCs in 2008 and 2009 and their ability to defend against infection and aid wound healing. Like our natural killer cells, they are essentially born ready for action. Other, so-called adaptive immune cell types need to be educated on what to attack, typically by exposure to it, and develop receptors and a memory for these so-called antigens, said Baban, the study’s corresponding author. The need for this education leaves babies with immature adaptive immune systems for their first few months of life, said Baban, which is when levels of ILCs appear highest. While present throughout life, it’s early on that ILCs appear particularly vital: “When you knock these guys out, you are dead,” Yu said of attempts to create animal models in which the fast-reacting cells had been removed. Conversely, levels seem to drop with age, possibly as adaptive immune cells mature and take on some of their responsibility, Baban said. Yu has been doing cleft lip and palate repair for nearly 25 years, and he and Baban decided to team up to explore the surprisingly low rates of surgical site infection considering the amount of bacteria found in even the cleanest, healthiest mouth. While the bacteria count would support infection rates more like 5-7 percent, rates today are under 1 percent, said Yu, a study coauthor. Their research found all three types of ILCs – types 1, 2 and 3 – in the lip tissue, but mostly type 2, which is more good news since these cells typically function like the director of the SWAT team, Baban said. “Type 2 cells basically dictate to the other cells how they should behave, how they should function,” he said of the always-hierarchical immune system. While they were the first to document ILCs in the mouth, the researchers weren’t really surprised to find the cells there. Shortly after birth, fast-acting ILCs appear to populate babies, particularly concentrating on the alimentary canal, which is the path that food follows and where their maturing immune system is housed, said Baban. The cells gather in barrier surfaces like the mucosal lining of the intestines, airways, as well as skin, the body’s largest organ, and any place that comes in contact with outside substances from food to water to other humans, Baban said. The researchers’ current and future studies include comparing cell numbers in young and older healthy mice. Baban also is looking at the potential role of these cells in a range of disorders from gum disease to melanoma and traumatic brain injury with the long-term goal of giving patients doses of these cells to better combat their disease. This will include identifying which ILCs naturally fight which infection and/or disease. A dose of these cells may even one day replace an antibiotic before surgery and help combat the epidemic of antibiotic resistance, Baban said. Dr. Erika Simmerman, a surgery resident at MCG and Augusta University Health, is the study’s first author. Researchers at the University of Southern California, Los Angeles, Department of Molecular Microbiology and Immunology also are collaborators.